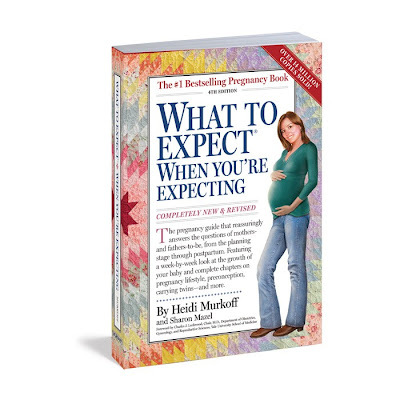 With the much anticipated movie coming out in theaters on May 18th, what better way to help celebrate than reading the book "What to Expect When You're Expecting" by Heidi Murkoff. Pregnancy seems like such a long time ago for me as my youngest child is now four years old and heading into junior kindergarten in the fall. I had many a pregnancy book in my collection but none of them could compare to this book for the vast variety of information inside. If you aren't familiar with this New York Times bestseller, "What To Expect When You're Expecting" is a brilliantly written book about what to expect before, during and beyond pregnancy as new soon-to-be parents. The title itself says it all as this book is considered the pregnancy bible. "What to Expect When You're Expecting" is read by more than 90% of pregnant women and is the must-have book for parents-to-be. There are currently over 14.5 million copies in print. The fourth edition was released in 2008 and is a book for a new generation of expectant moms. It features a fresh new look on pregnancy and a friendlier than ever voice from Heidi Murkoff. It's filled with the most up-to-date information that a new parent could be looking for not only for pregnancy itself but also things that are relevant to the pregnant woman. There are sections in the book for every pregnancy matters practical, physical, emotional, nutritional, and sexual as well as more support for the other very important partner in parenting, the dad-to-be. The book has tons of tips, helpful hints and humour to set the mood for the next nine months. "What To Expect When You're Expecting" is like your own personal pregnancy assistant, only better! If you are expecting or know someone who is, it's definitely one to add to the home library. You can purchase this book at most book stores like Chapters for about $18.95. Disclosure: Posted by AME on behalf of Thomas Allen & Son. We received a complimentary book. Opinions and comments on this blog are those of AME. I want to win this for a friend's daughter. I'd love to win this for myself as we started TTC. Thanks for the giveaway. I have a copy of my own that I used a lot the first time around and will consult again now that I`m pregnant with baby No. 2! I`d love to win one to gift to a friend! A friend who's pregnant with her first.